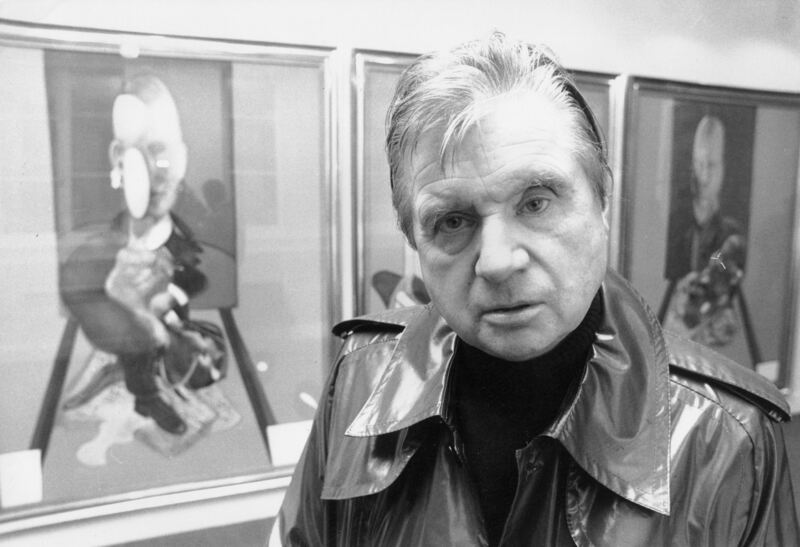 Francis Bacon was born on Lower Baggot Street in Dublin, Ireland on 28th October 1909. Emotionally, his childhood was a fraught one, the young Francis often finding himself locked in a cupboard whenever his natural inquisitiveness became too bothersome for his mother. At the tender age of 16, Francis left home and embarked upon a number of adventures across Europe, starting with London where he arrived in the autumn of 1926. 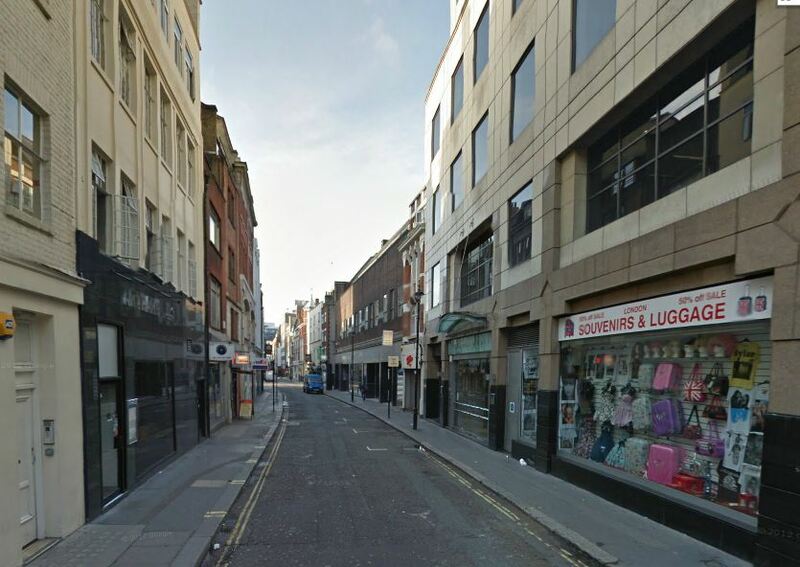 During his first encounter with the capital, Francis secured work in a women’s clothes shop on Poland Street in Soho. However, his young and carefree attitude didn’t sit with such a conventional business and, after insulting the store’s owner, he was promptly sacked. Bacon then tried his luck in Berlin which, in those days before the spectre of Nazism erupted, was a liberal hotbed of art, literature and creative thought. He then ventured onto Paris, where he was especially taken with French culture, quickly discovering a passion for good food, wine and the latest trends in art. In 1928, Bacon returned to London where he soon established himself as an interior designer. 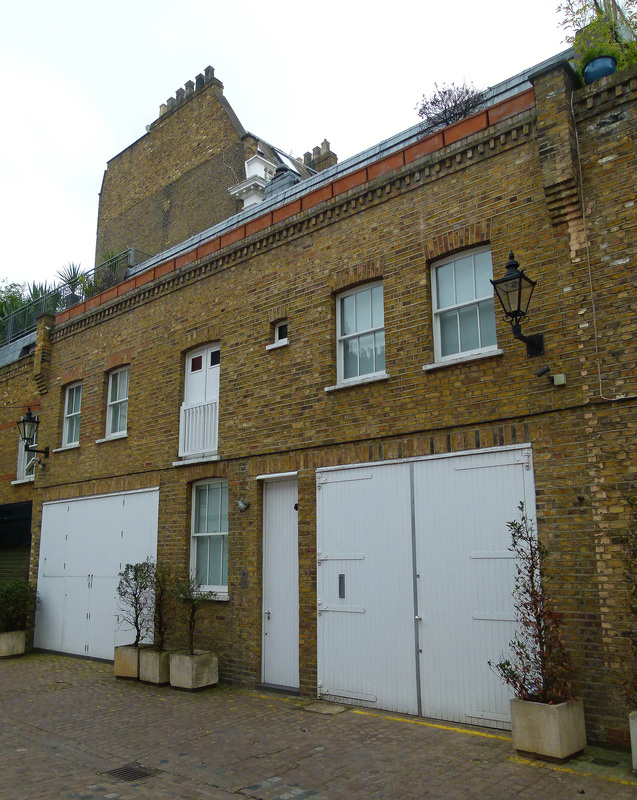 His new business was based was in a tiny flat on Queensbury Mews West in South Kensington… a location he perhaps picked thanks to the small French community which continues to flourish around the area to this day. Queensbury Mews West. 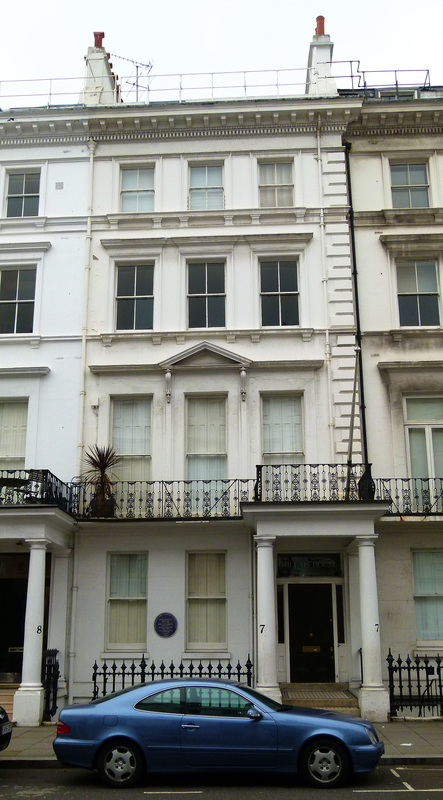 Francis Bacon’s apartment was on the top floor of the right hand block. Bacon left the mews in 1931 and spent several years drifting in and out of accommodation around Chelsea, Fulham and Hampshire. Upon the outbreak of war in 1939, he presented himself for military service but was rejected on medical grounds due to his asthma. Following this refusal, Francis volunteered as an air-raid warden; a role which would have brought him into regular contact with the carnage wrought by the nightly shower of bombs, the dust from rubble only serving to make his breathing even more troubled. Devastation, 1941: An East End Street. 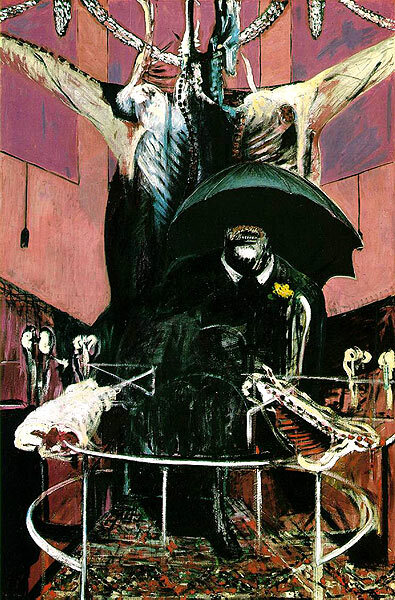 This painting was created by Graham Sutherland, a friend of Francis Bacon. In 1943, Francis Bacon moved to new digs in the ground-floor flat of 7 Cromwell Place, a stone’s throw from the Natural History Museum. At the time, the building was rather draughty having suffered considerable bomb damage. This didn’t bother Francis though; he was more concerned in blacking out the windows… not as an air-raid precaution, but as cover for an illegal gambling den he’d set up! Throughout his life, having a high-stakes flutter proved to be one of Bacon’s true vices. It was a mind-set which also influenced his work. Having received no formal art-training, he frequently viewed the practice of trying out risky new techniques as a gamble… when it didn’t pay off, the offending canvas would be slashed and destroyed. 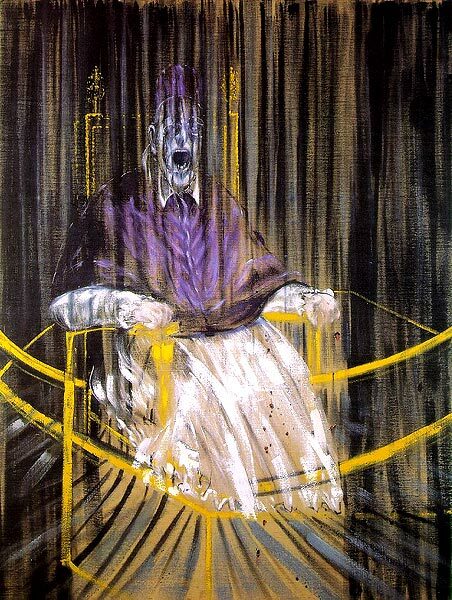 Betting aside, it was at Cromwell Place that Francis Bacon’s career as an artist really took off when, in 1944, he set about painting Three Studies for Figures at the Base of a Crucifixion…. 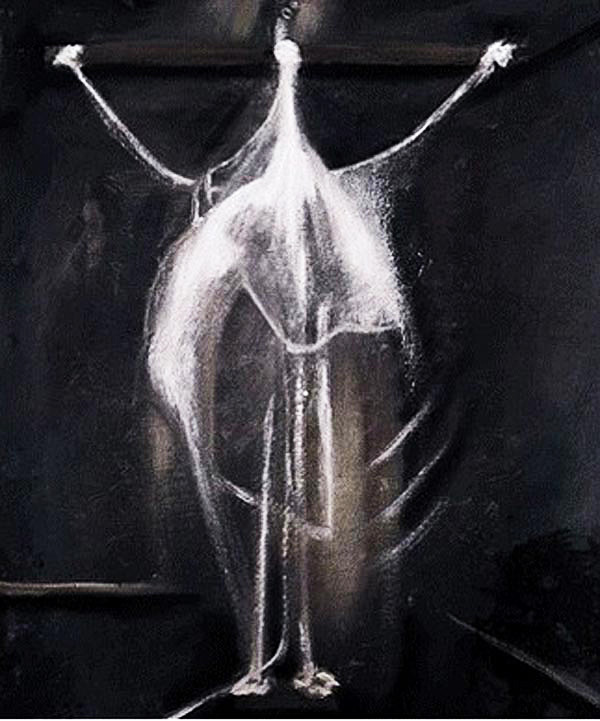 Three Studies for Figures at the Base of a Crucifixion, created in Bacon’s Cromwell Place studio. This ‘triptych’ of grotesque creatures, which could be seen as representing the torment of war, the baying mouths reminiscent of the fascist dictators who’d plunged Europe into darkness, were first displayed at the Lefevre Gallery in 1945 on Mayfair’s Bruton Street. The face of hatred… two barking mouths… Hermann Goering and one of Bacon’s surreal creatures. 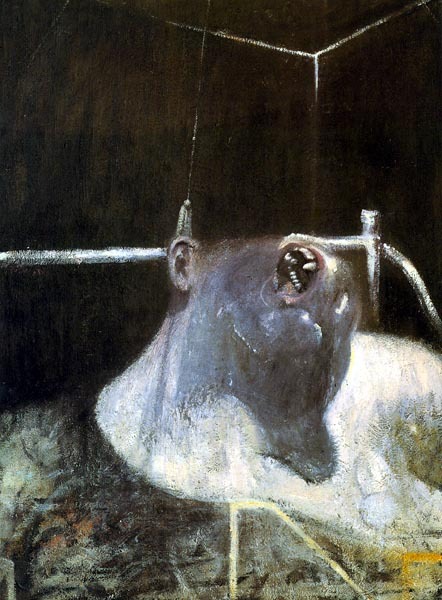 After thoroughly unsettling the public, the trio of disturbing images were acquired by the Tate Gallery in 1953. 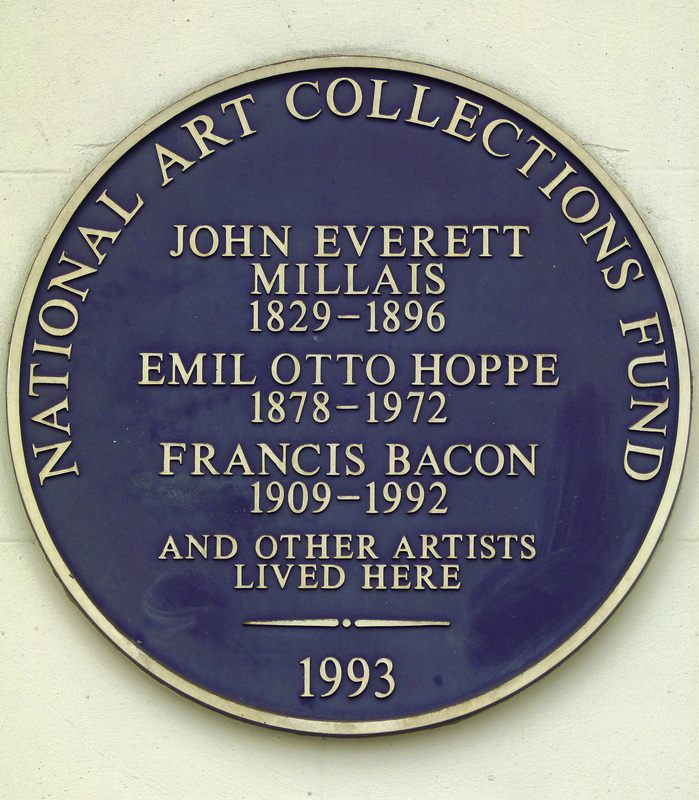 Plaque at 7 Cromwell Place… which demonstrates Bacon was in good, historic company! 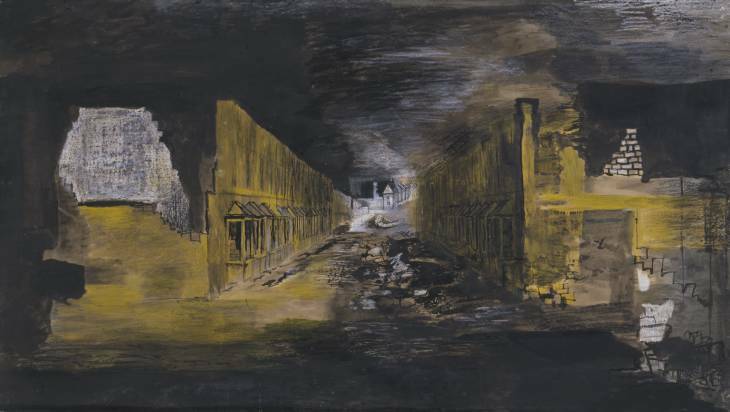 The next startling piece to emerge from the Cromwell Place studio was another surreal work simply entitled, Painting which was unveiled in 1946. Painting was displayed at the Redfern Gallery on Cork Street and was promptly purchased by a dealer for £200; approximately £6,700 in today’s money. Once the art-world had discovered Francis Bacon there was no stopping him, and for the next 47 years he provided galleries with a regular stream of challenging and deeply unnerving works. 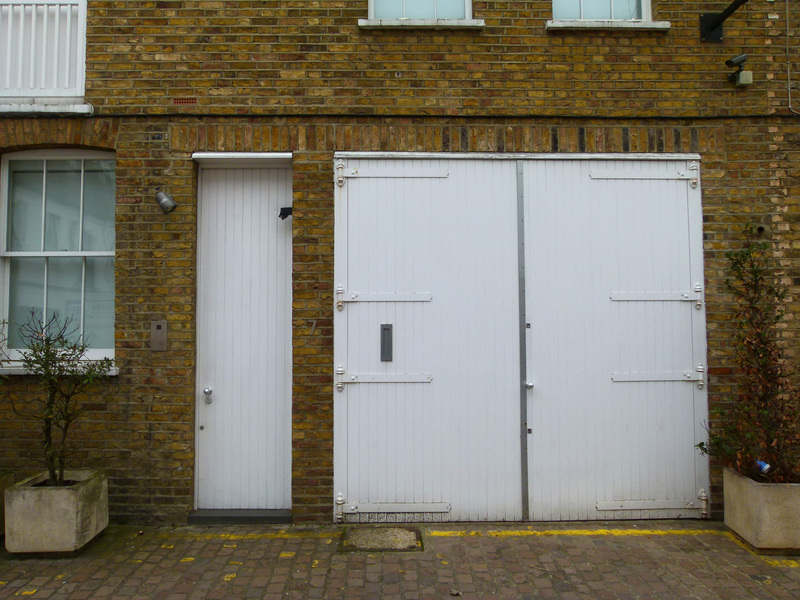 In 1961, Francis Bacon moved to a new studio on Reece Mews, moments away from South Kensington junction and his former premises on Cromwell Place. Converted from a former horse stable, Bacon would maintain the studio for the rest of his life. 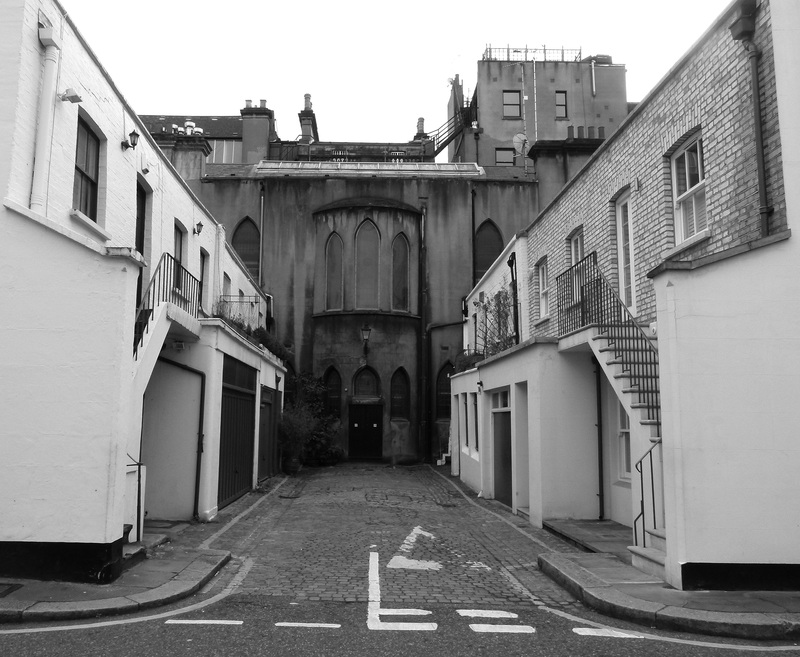 Despite his wealth and fame, the Reece Mews property remained starkly simple. The artist occupied only the upper level, which was reached via a dangerously narrow staircase (presumably, his large canvases were hoisted through the upper balcony door). 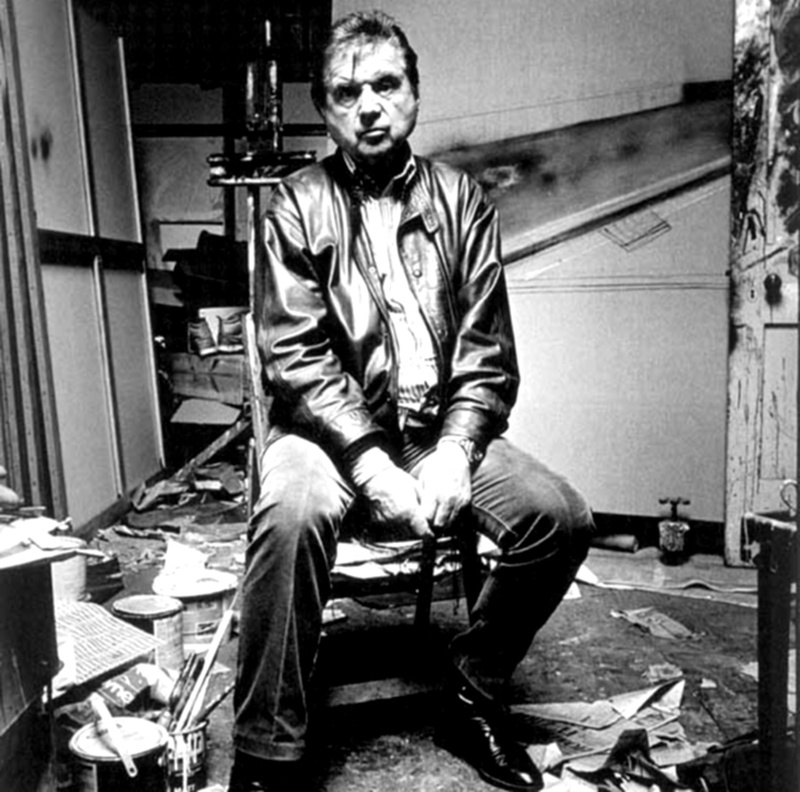 Francis Bacon in his studio, 1984 by Bruce Bernard. © Estate of Bruce Bernard. The toilet was squeezed out on the landing, as was the kitchen… which also contained a bath! During the colder months, Francis would light the cooker’s gas hob and use it to heat the room up whenever he took a dip! 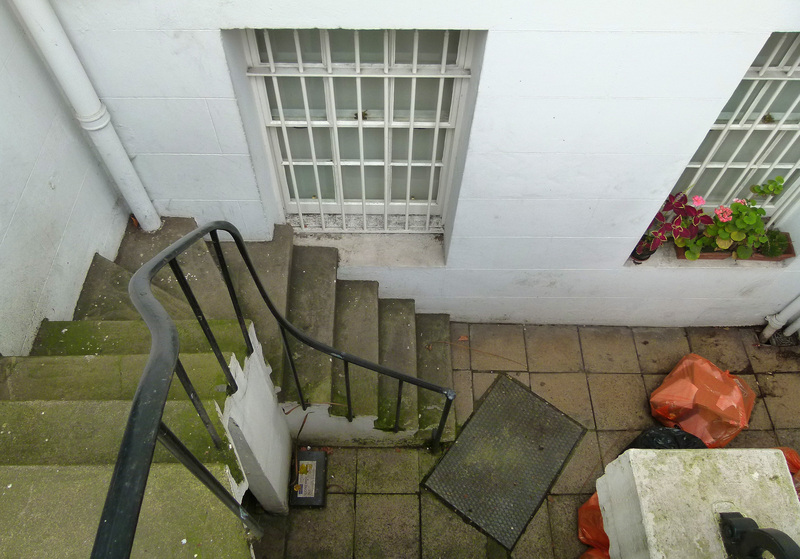 Essentially, the South Kensington studio was for working and sleeping in only. 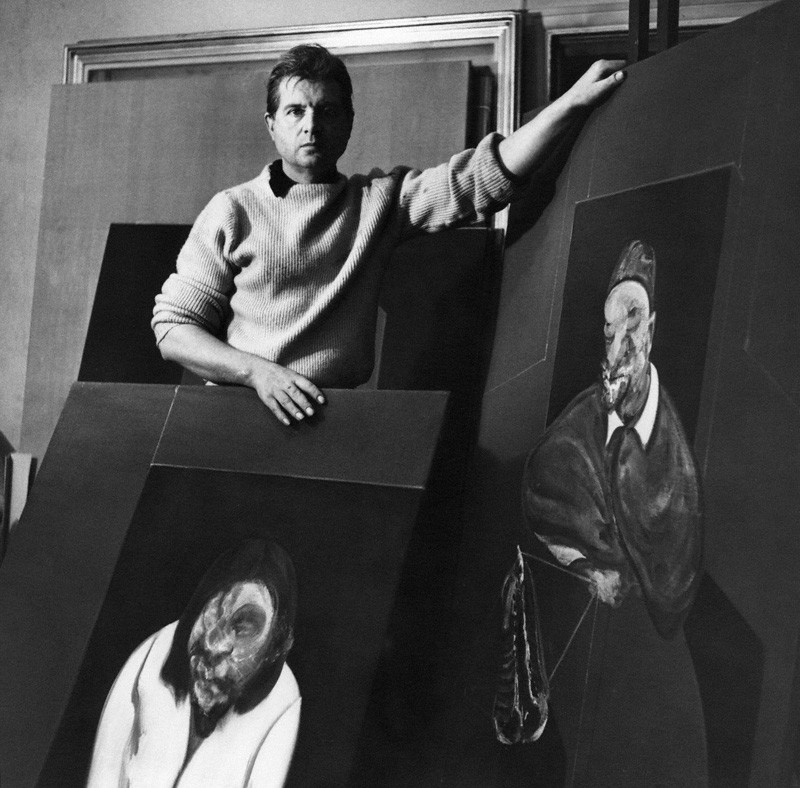 When he wasn’t painting, Francis Bacon could be found out and about in London’s West End, a regular face and much loved character amongst the bohemian bars and restaurants of Soho. It was in the West End that Francis Bacon splashed around much of his fortune; gambling heavily and showing great generosity towards friends when it came to paying the bill for many a large meal; especially at his favourite restaurant, Wheelers on Mayfair’s St James’s Street. 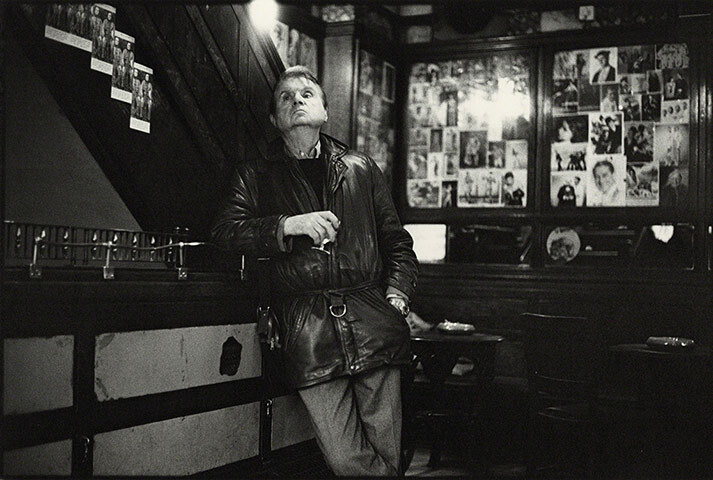 In 1948, Francis Bacon became one of the founding members of The Colony Room on Dean Street; a Soho institution and legendary hang out for the unorthodox which sadly closed in 2008. 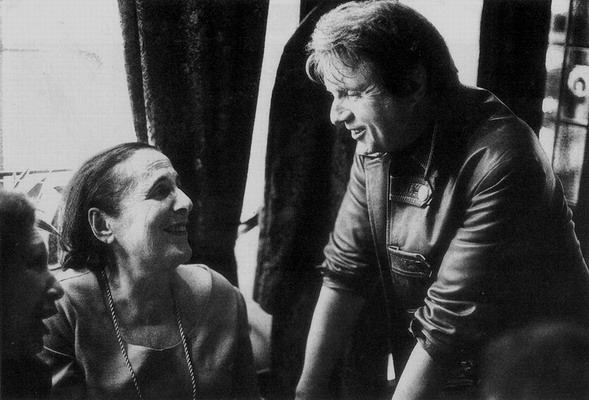 On 28th April 1992, whilst visiting a friend in Madrid, Francis Bacon suffered a heart attack, and passed away at the age of 82. 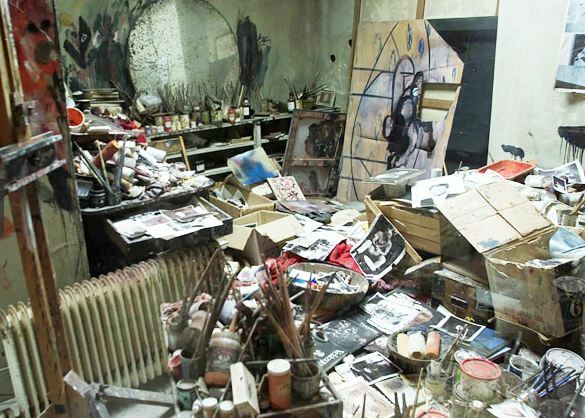 His famously scruffy studio, in which he still had a number of works in process, lay undisturbed for a number of years…. That was until 1998, when the Hugh Lane gallery in Dublin decided that the workshop of one of the city’s most famous sons deserved preserving. For three years, a team from the gallery carefully catalogued and noted the position of every single item in the haphazard South Kensington studio; thousands of books, photographs and other materials. The items were then carefully packed away and taken to the Dublin gallery where they were painstakingly reassembled into their original layout. Even the paint-splattered walls were transported to the Irish capital. The result is an extraordinary, protected time capsule which is now a popular tourist attraction. To find out more about the relocated space, please click here. 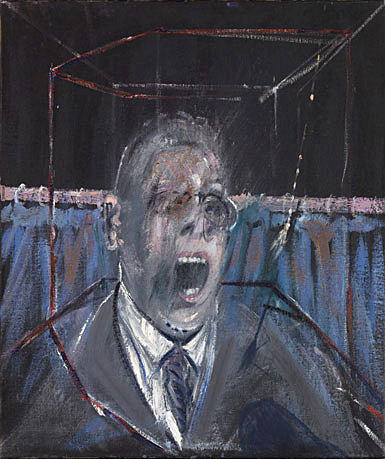 To this day, Francis Bacon’s paintings, with their mysterious distortions and numerous, tormented jaws locked in perpetual, frozen screams, remain intriguing and unsettling. Can i say thankyou for writing such interesting pieces. I love London and get so much more enjoyment knowing little snippets of info that you are providing. I hope you are compiling these stories in order to produce a book. It will be a best seller. Thankyou once again ! An excellent post, as always. You often bring things to my attention that I have ignored/been ignorant of and I learn a lot because of it. Keep writing! Fantastic article, very interesting and extremely well written. really useful for my Art coursework! You’re very welcome, William. Many thanks for your kind comment.